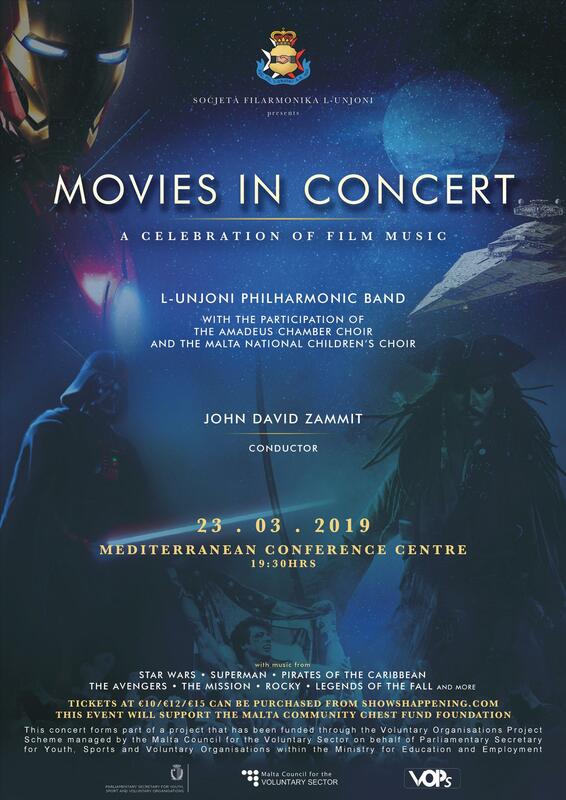 Following the success of last year’s concert ‘Movies at the Palace’, the Soċjeta’ Filarmonika L-Unjoni of Luqa, under the direction of John David Zammit, is holding another spectacular concert focusing on film music. The symphonic wind band will be complemented with various string instruments to form an orchestra of around 90 musicians who, together with the Amadeus Chamber Choir, the Malta National Children’s Choir and singers Tiziana Calleja, Eleanor Cassar and Chris Grech, will provide a special night to remember. The event will also include the use of visuals and advanced lighting technology, making this evening perfect for film enthusiasts, families and regular concert goers. This year's concert will once again feature iconic movie scores penned by the best composers of this genre, such as Hans Zimmer, Ennio Morricone and John Williams. This year’s play list includes music from Star Wars, The Avengers, The Mission and Pirates of the Caribbean, amongst others. This concert is being organised with the support of the Voluntary Organisations Projects Scheme managed by the Malta Council for the Voluntary Sector on behalf of Parliamentary Secretary for Youth, Sports and Voluntary Organisations within the Ministry for Education and Employment.